To better support the desktop requirements of eComStation and IBM OS/2 users, Serenity Systms International offers a 12 month support agreement for OpenOffice.org. 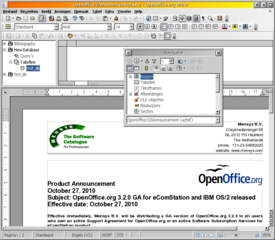 As part of the support agreement, users will receive versions of OpenOffice.org developed and tested to run on eComStation and IBM OS/2. OpenOffice.org 3.1.1 is now included in the eComStation 2.0 product license. The OpenOffice.org 3.2.0 update can be downloaded as part of Software Subscription Services for eComStation. OS/2 users still can obtain the support agreement if they so require. OpenOffice.org for IBM OS/2 and eComStation users has successfully passed all the testing procedures in place for other platforms, including Microsoft Windows(r), Linux, and Solaris(r). This includes a 48 hour automated testing cycle designed to use every dialog and runtimes exceeding 24 consecutive hours during which the application is subjected to constant usage. e-mail related settings are now supported, you can email your current document, but only Thunderbird is supported. the default OS/2 browser will be used for opening web pages from URL links in documents. support for WPS integration via seperate package. support for the FreeType2 (FT2) font engine for improved text rendering. support for clipboard bitmap formats and unicode text. the quickstart feature has been implemented for eComStation and OS/2. It is also part of the eComStation 2.0 product license. Fixes and enhancements will be delivered to all active Support Agreement users. MSRP for the Support Agreement for OpenOffice.org for OS/2 is $49US. MSRP for renewals is $29US. See where to buy? for availability in your region. Serenity Systems International and Mensys B.V. will comply with all elements and restrictions associated with the licensing and distribution and use of OpenOffice.org. Password protected Microsoft Office XML files (supported document types: MS Word 2007 documents (*.docx, *.docm); MS Word 2007 templates (*.dotx, *.dotm); MS Excel 2007 documents (*.xlsx, *.xlsm); MS Excel 2007 binary documents (*.xlsb); MS Excel 2007 templates (*.xltx, *.xltm); MS Powerpoint 2007 documents (*.pptx, *.pptm); MS Powerpoint 2007 templates (*.potx, *.potm)). OLE objects, form controls and pivot tables can now be read from MS Excel 2007 documents (*.xlsx, *.xlsb). Microsoft Word documents to be saved (using the Microsoft Office standard RC4 algorithm). Faster start up times: OpenOffice.org 3.2 Calc and Writer have both reduced 'cold start' time by 46% since version 3.0 (results will vary on different operating systems and hardware). When launching OpenOffice.org 3.x, users are presented with the Start Center that allows the selection of an application within the office productivity suite without having to click the File -> New menu. The PDF export feature in OpenOffice.org provides a huge set of formatting and security options; so that PDF files can be customized for many different scenarios. OpenOffice.org 3.x allows Writer users to view pages with single-page, two-page side-by-side and book layout options. The new version of Notes in OpenOffice.org 3.x provides additional formatting, spell checking and accessibility features while displaying notes within the margins.